"Nothing is permanent. Not even the end of the world." The New Hunger is set seven years before the event that take place in Warm Bodies. Originally it was published in e-book form, but last Fall it was published in paperback in anticipation of Issac Marion's release of book two in the Warm Bodies Series. This novella follows the lives of Nora, Julie, and R as they slowly make their way towards one another. It is a look at the end of the world, the rise of the dead, and possibly foreshadows what's coming in the next book, The Burning World. It has been a while since I've read Warm Bodies, and I have forgotten just how much I adore Issac Marion's writing style. 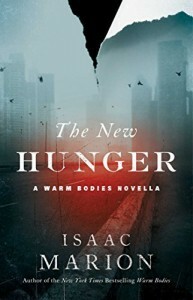 The New Hunger pulled be back into the world Issac Marion created in the first book, and it wouldn't let me go. I loved the shifting point-of-views in the novella. Which let the me see the end of this world through three set of eyes instead of one. Each of them saw it differently. Nora and Julie were just trying to survive and R just wants to understand, to remember. The plot of The New Hunger moves steadily right out of the gate between all three of our characters. It starts with us joining them on their journey and until slowly they reach each other in Seattle. However, never once did I feel like any moment was rushed or out of place. Despite being so short, so much happens inside of this novella. Twelve-year-old Julie starts to turn into a women from the backseat of her families SUV while the search for a safe place to call home again. Nora, just sixteen, is trying to keep both her and her baby brother alive in the exed out city of Seattle. Which leaves R, who just reanimated as a member of the Dead. All of this molds into something tragically beautiful because of Issac Marion's writing style. My favorite part of the The New Hunger is R's part of the journey. Issac Marion once again put us in the mind of a zombie, but this one has just woken up. Through the novella R is learning how to be this new thing, to understand this screaming Beast inside of his mind. It was unnerving to watch at times, and occasionally I had to the put down just to give myself a minute. Throughout the novella you see the different between R and M. You start to see why R is different from all the other Dead in Warm Bodies. We even get to see just how much control the Boneys have over the Dead in The New Hunger. Which would explain their behavior in Warm Bodies. The whole novella is wonderfully down, at least that's how I felt. I honestly don't have many complaints about it. Well, I have a tiny one that was kind of awkward, but I don't want to mention it because it feels like a spoiler. Especially if you haven't read, or even seen, Warm Bodies. It was definitely worth the wait to get The New Hunger in physical form to read it, and I'm going to have to buy it to add to my collection. Even better though, it was a great buffer for my long wait for August when the next book in the series finally arrives. I might even have to reread Warm Bodies before then as well, just because it's been a while. Might need to refresh all the feelings from book one. If you haven't read anything by Issac Marion I totally urge you to do it. He's definitely one of my favorite authors out there, and his books just aren't about zombies and the end of the world. It's about so much more.